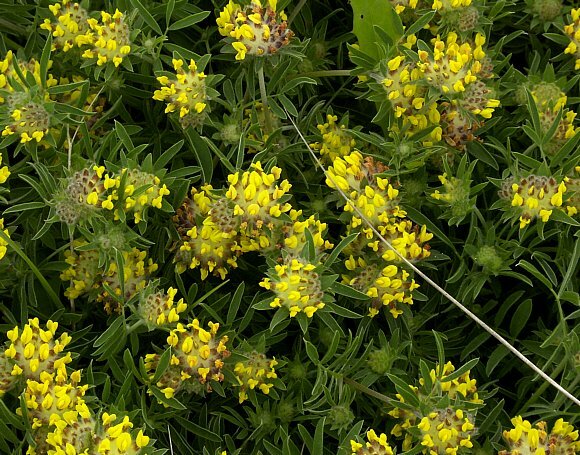 A very long raft of Kidney Vetch. 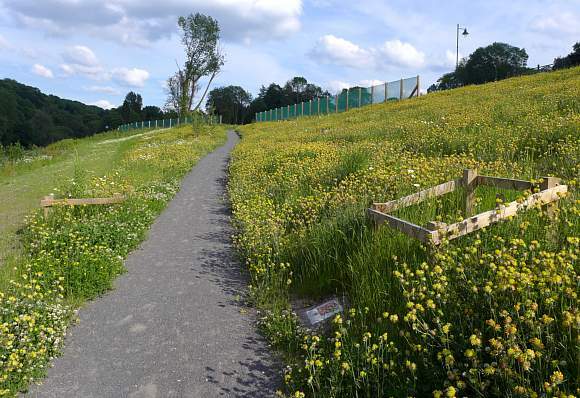 With a few interloping white Oxeye Daisy flowers. A small clump helpfully overhanging the towpath edge. 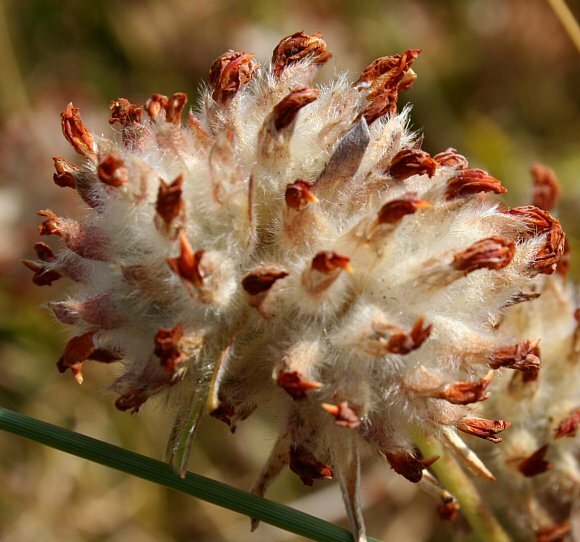 The florets grow amidst a fluff of fine hairs looking like cotton-wool. 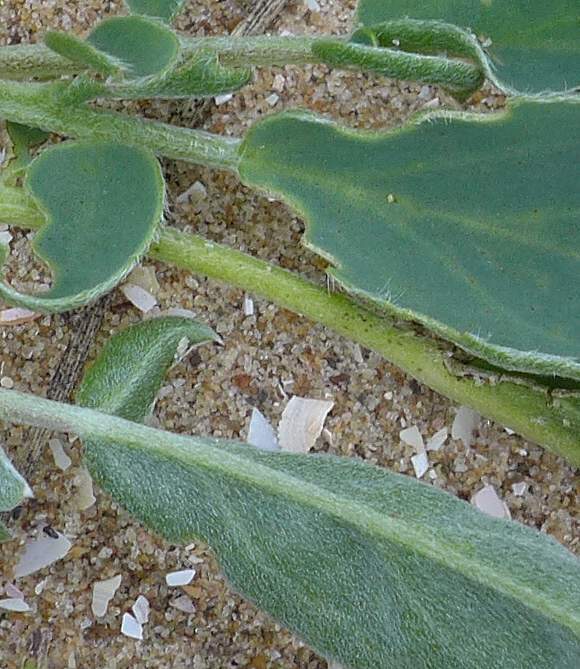 The leaves are finely hairy and pointed. Some plants are very hairy. 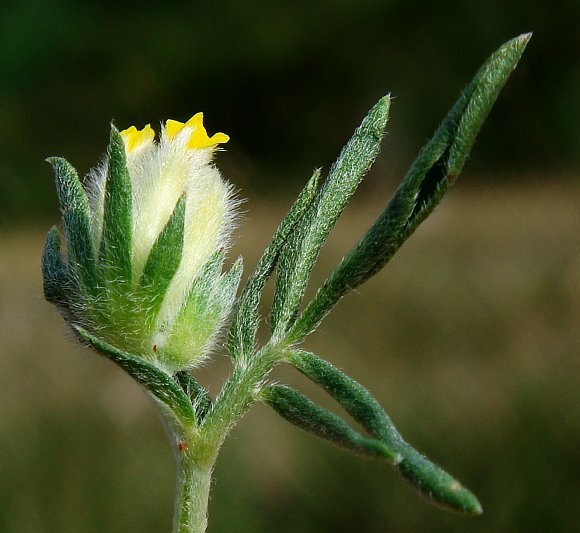 The very hairy leaves just below the flower-head are 4- or 5-fingered and close together. 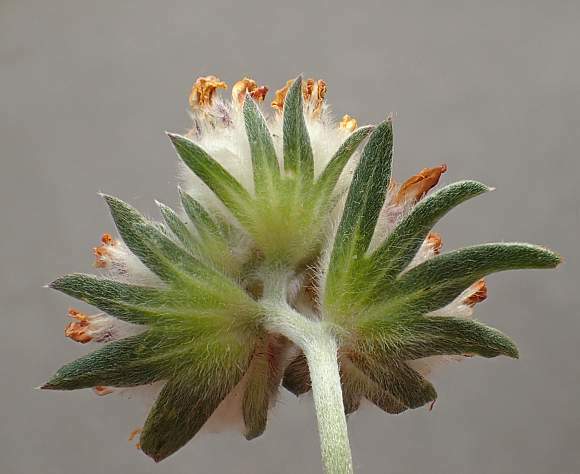 The stem is covered in short white appressed hairs. 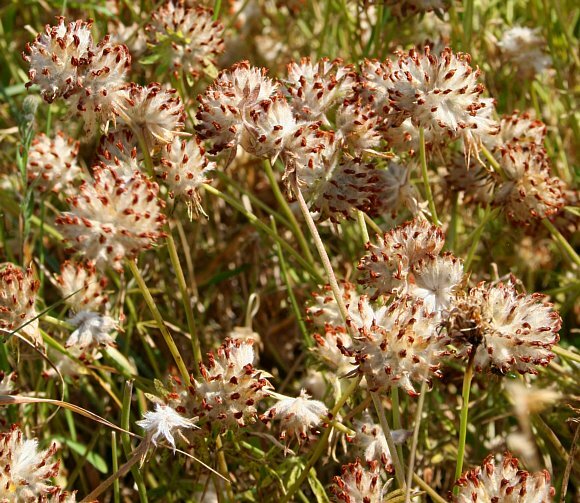 Flowers withering, turning to seed. 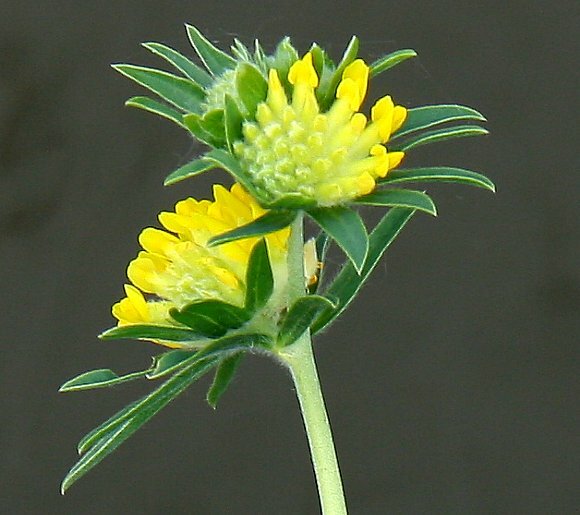 The two keels of the flowers are usually well hidden within the two wings. 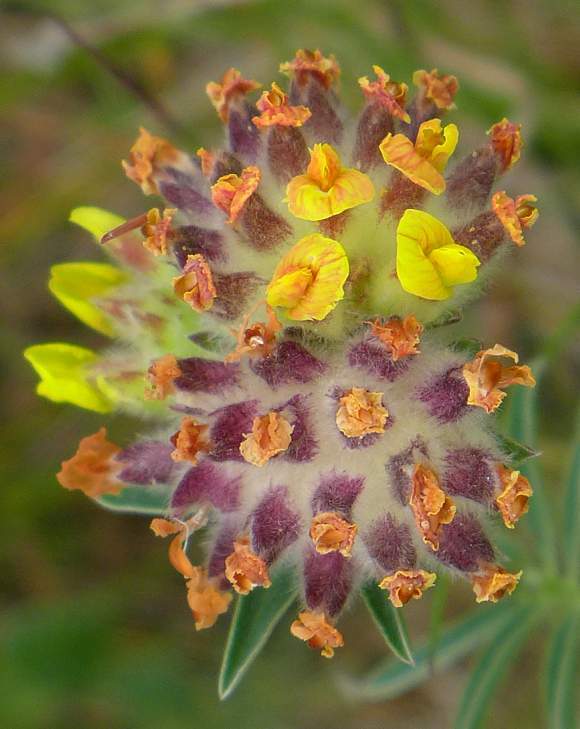 Spent flowers remain on the flower-head and turn a tan-brown and the wings part slightly to reveal the small keel within (top, middle). After flowering the seeds are amidst cotton downy fibres. 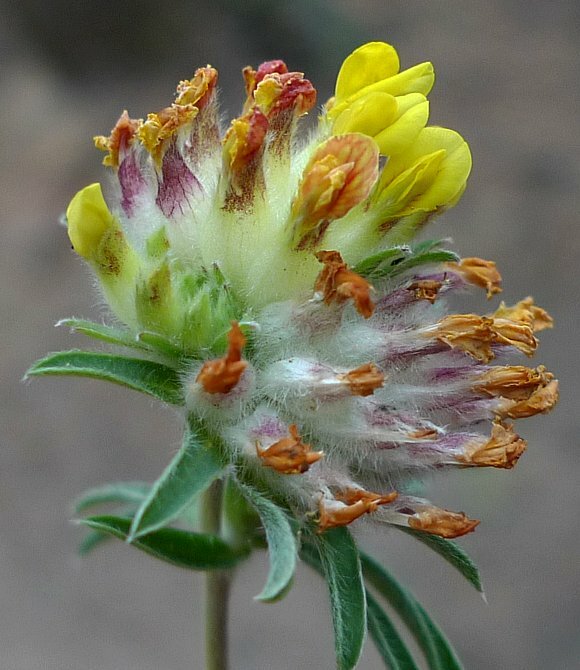 Kidney Vetch always has a fuzzy look. 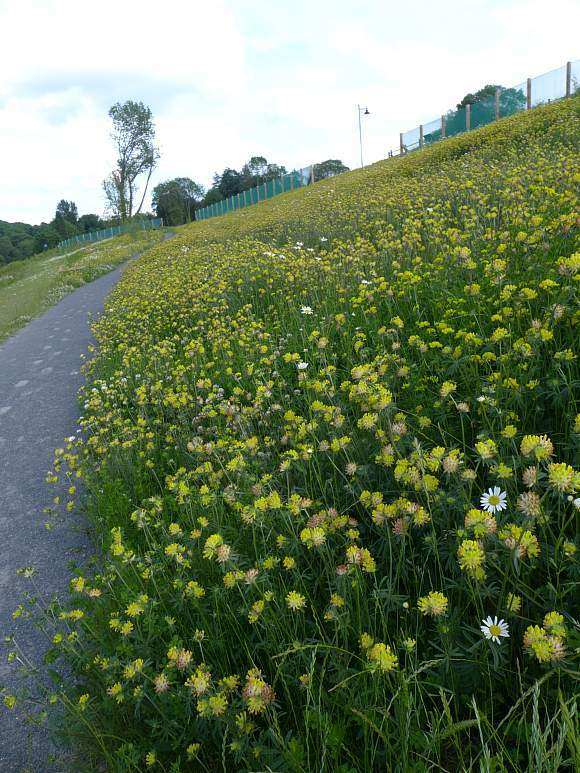 Going to seed at the end of season. 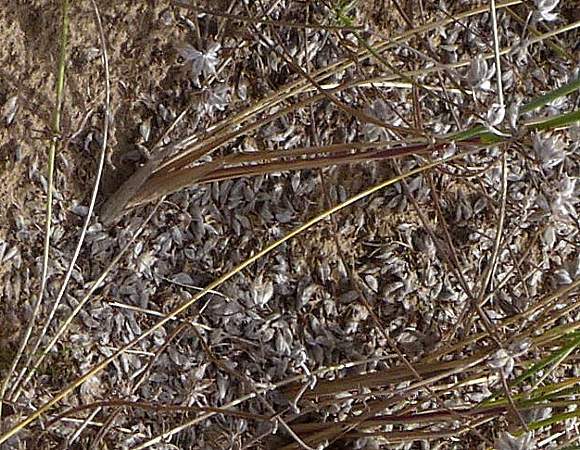 The seeds lying on the sand. 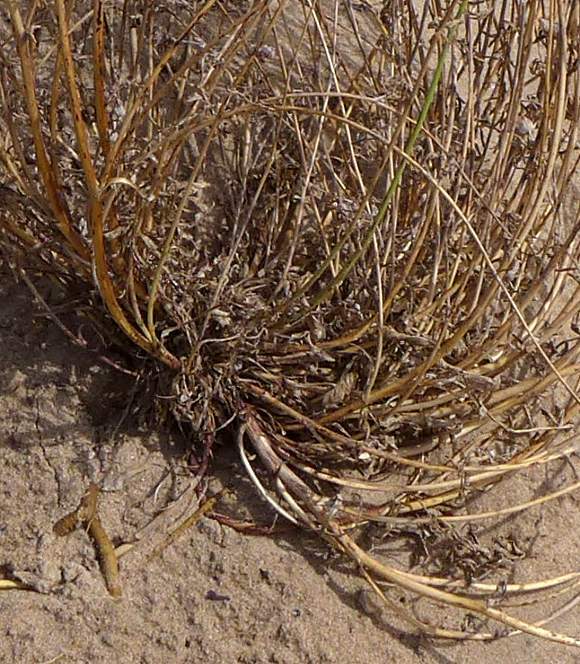 When 'finished' the whole plant dries and goes brown curling itself into a ball which will catch the wind like so-called 'tumbleweed' does in the American deserts. 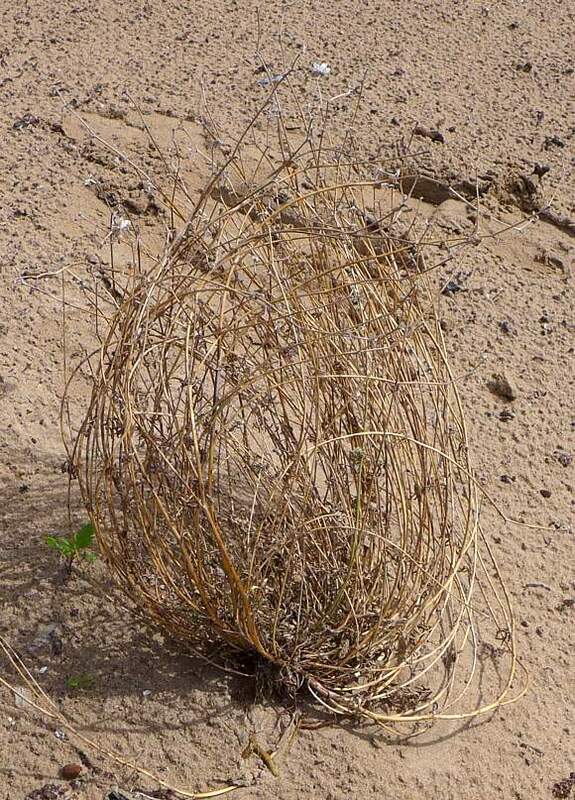 Tumbleweed can be any plant which breaks away from its roots in Autumn. They are rolled along by the wind to places far from where they grew, with some ripe seeds still attached. By this means plants which do this are able to spread far afield. Some of the roots are still attached on this 'tumbleweed' - which assumes a round cage-like structure. End of season. 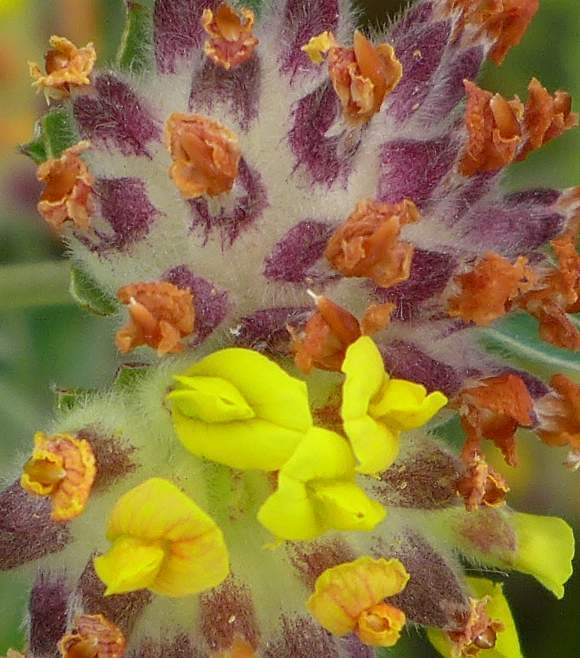 The basal leaves are often hidden by a mass of flowers, now exposed. 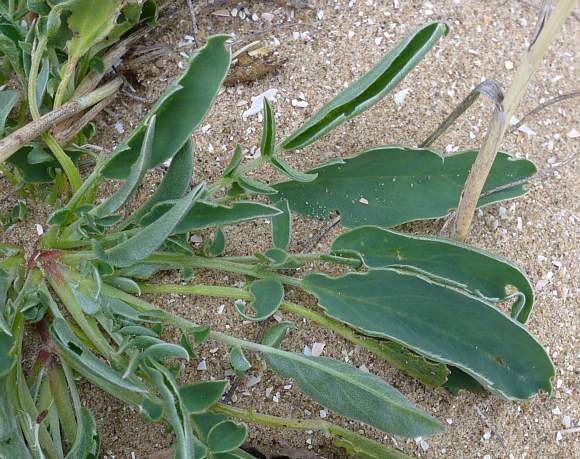 Basal leaves a glaucous greyish-green is irregularly lobed (sometimes very deeply so - lower left) on a stalk as long as the leaf. Leaves thick and often fleshy. Uppersides matte, leaf stalks and underside hairy (lower leaf). The flowers are on the ends of long bare stalks with the odd leaves here and there. 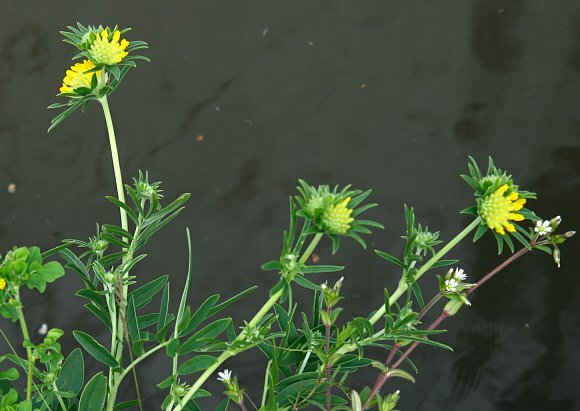 Side-branches are thinner and have a pinnate leaf beneath. The red form of Anthylis vulneria, but, growing in Anglesea. This is probably not Anthylis vulneria var. coccinea which Prof. Prof. Clive Stace says grows in West Cornwall and Pembrokeshire. There is also a pink form. 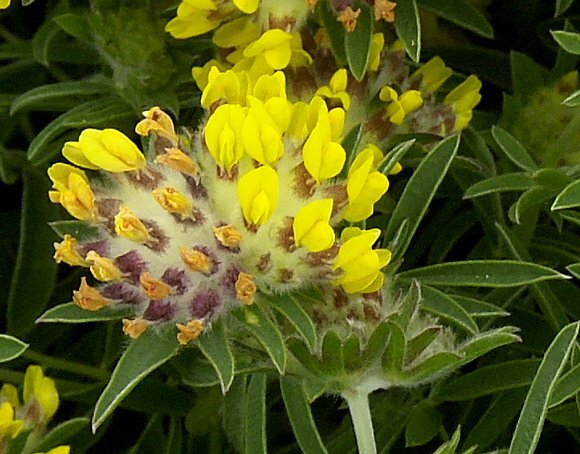 With both pink flowers and pale-yellow flowers. 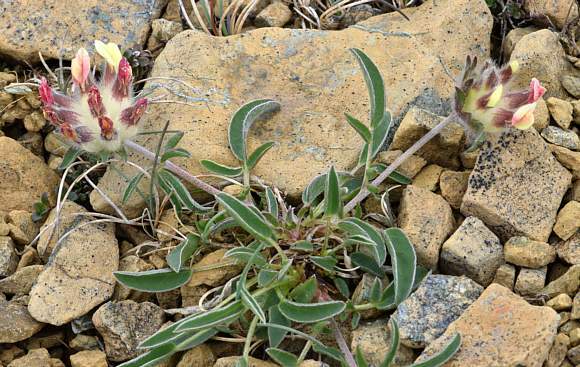 See Keen of Hamar or Serpentinic Rocks for some reasons why plants groing on the Keen of Hamer often differ in form to the same species growing on mainland Britain. 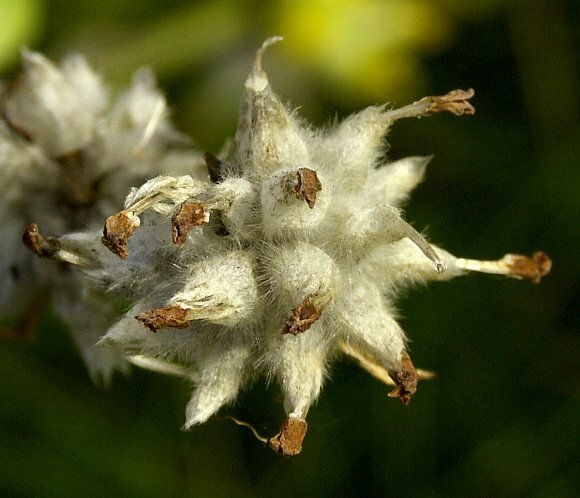 Distinguishing Feature : A flower-head consisting of a small ping-pong-sized fuzzy balls with numerous small yellow Pea-Family like flowers protruding from what looks like a ball of cotton wool. Very distinctive. 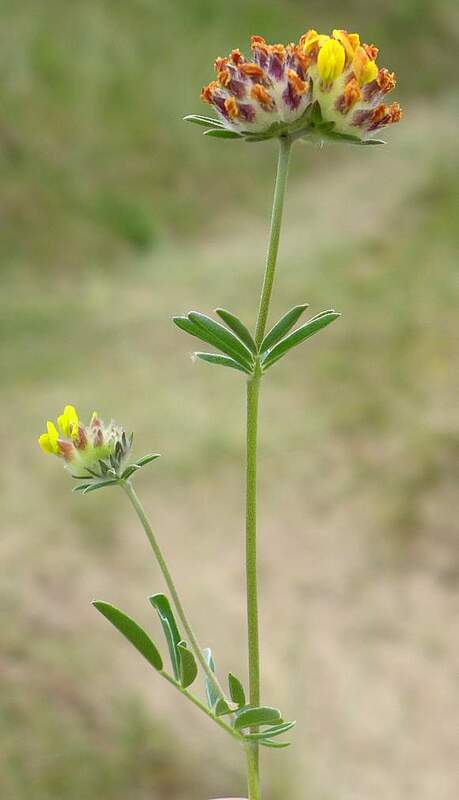 A unique feature were it not for the fact that Kidney Vetch exists as 5 sub-species, all looking much the same (see below). 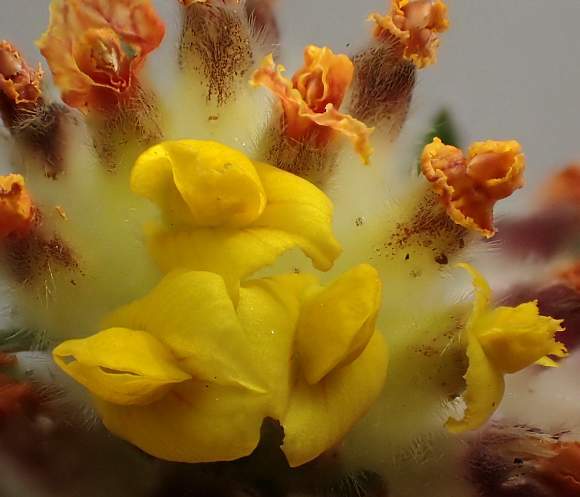 Easily confused with : five other sub-species of Kidney Vetches, if you can find them. Sub-species, according to BSBI. Two are in decline and have not been spotted in the UK for decades, the others are still around in some places. Luckily, none of the others are to be found where your Author found the most abundant of Kidney Vetches, the one detailed here. 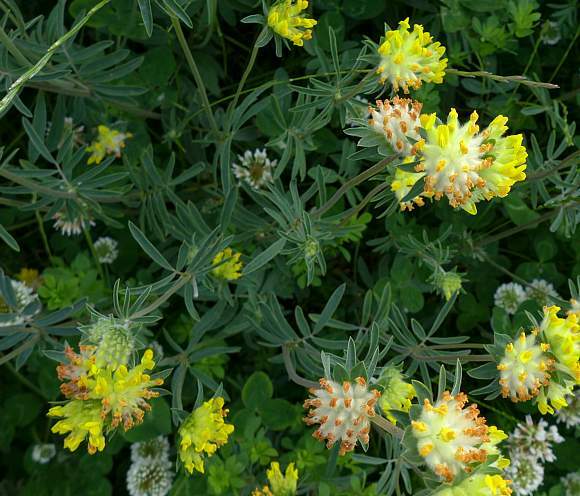 Kidney Vetch is highly variable, with flowers varying from pale to deep yellow, orange or scarlet-red. 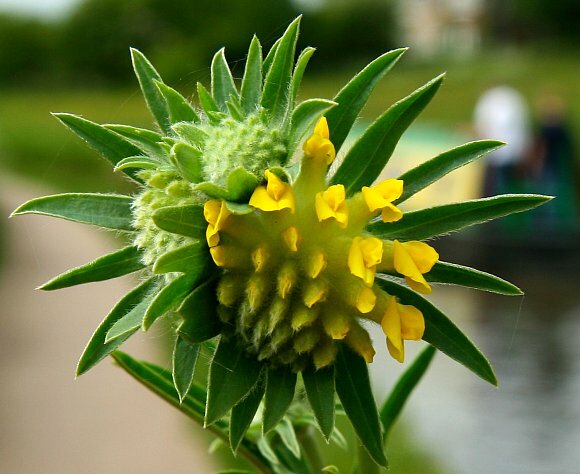 It is quite possible that the photos from the Caldon Canal represent the sub-species anthyllis vulneraria ssp. polyphylla, but since your Author can find no photographs of this sub-species, it can only be an educated guess based on nothing more than the BSBI distribution map. BSBI distribution of sub-species anthyllis vulneraria ssp. polyphylla. On the other hand, it might not be. ssp. carpatica which occurs in only a few hectads scattered around the UK except Eire. ssp. vulneraria which is the modal species. which may explain away most of any observed variability. However, these sub-species are themselves variable and several specimens should be examined before any conclusion is reached (if any can be). 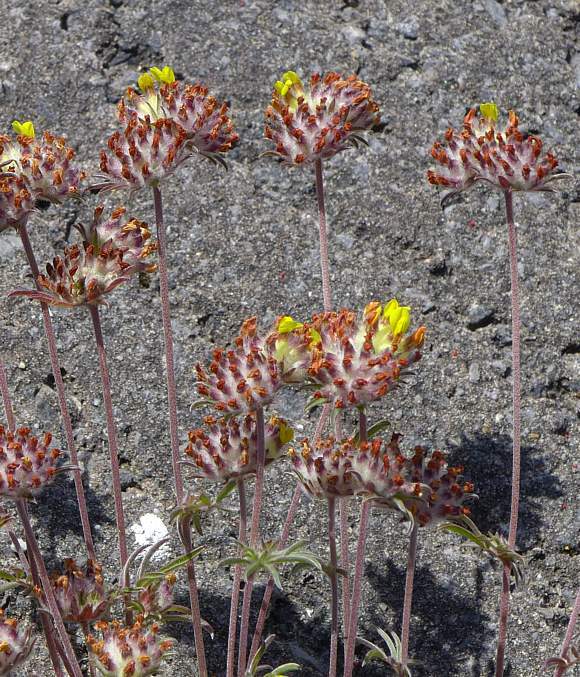 They differ only in subtle ways to do with the hairs, whether appressed or not, the calyx whether tipped with red or not, the colour shade of yellow of the corolla, the exact arrangement of the leaflets, and whether the leaves look 'kind of' succulent or not. All airy-fairy stuff. Update: apparently the authenticity of any sub-species is in doubt taxonomically, there may be just two sub-species, but even those are uncertain. var. pseudovulneria the modal variety. which differ in even more subtle ways from ssp. vulneria. 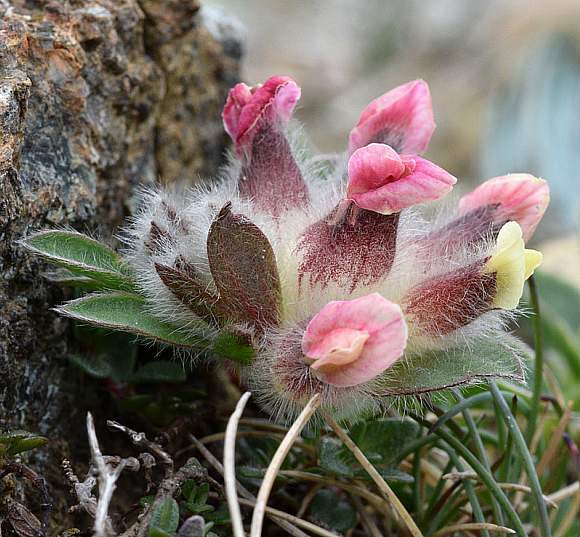 It prefers a dry habitat, on sea cliffs and mountain ledges or open limy grassland. 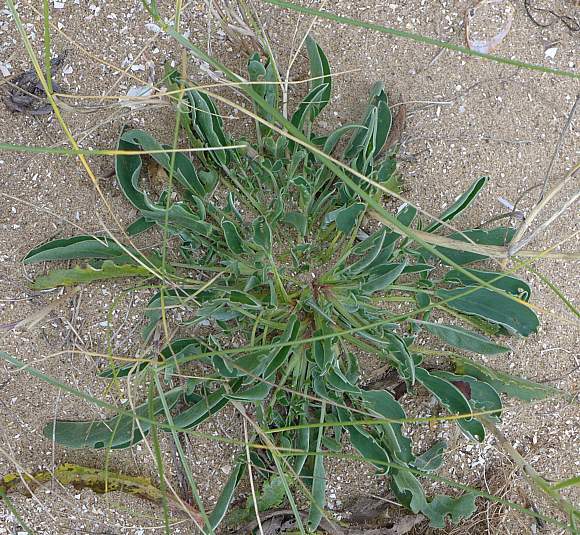 The specimens proliferating at the Southport locality are all on very sandy vegetation-covered soils just above the high-water mark, so it will be salt-tolerant. 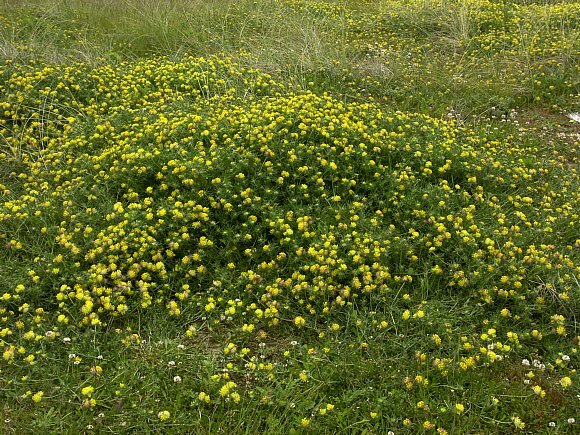 Often grows close to the sea above the high-water mark, or on sea cliffs or dry and open chalky grassland. Also on mountain ledges, although your Author has never seen it there, but maybe that is because he tends to avoid dangerously steep places on mountains.